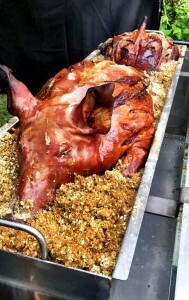 Royal Navy Baby shower with Hog Roast Saltash! Hog Roast Saltash can cater at any type of event you have coming up whether that is a wedding, birthday or even a corporate event! Due to our fully flexible style of cooking we can cater for any number of guests and are able to provide a variety of food to keep everyone happy despite any dietary needs or requirements. Last week we were lucky enough to be asked to cater for one of our favourite types of events; a baby shower. We just love catering baby showers as we get to see how excited everyone is about the arrival of a new family member and it is often the first time everyone gets to find out the gender of the baby. For Kim’s baby shower she really wanted a relaxed affair as she had found it stressful trying to organise the party by herself as her husband, Jake, was away with work as he was part of the Royal Navy. We assured Kim that we would take care of everything from there on in and would prepare the most delicious food for her guests. We settled on a simple menu of a whole roasted hog that would be served in floured rolls whilst the gift giving was taking place. Of course, it wouldn’t be a Hog Roast Saltash without our signature crackling and lashings of our homemade applesauce which was served on tap!